Nothing not to love about eggplant, in my opinion, especially given its glossy purple skin and spongy flesh that can take on a variety of flavors and textures. A member of the nightshade family, it’s quite a versatile vegetable and very low in calories. There are lots of things I like to make with it: eggplant terrine with tomato, basil, and goat cheese; grilled eggplant drizzled with balsamic vinegar; eggplant and red pepper purée with whole wheat pita chips; eggplant and lentil salad with toasted walnuts; and grilled vegetable parmagiana with eggplant, zucchini, portabello mushrooms, and buffalo mozzarella all come to mind. I occasionally also add some to tomato sauce when I’m in the mood for a heartier variant. I love all of these dishes, and have made them many times, but the days of farm-market-fresh eggplant were quickly waning: I wanted to try something new. 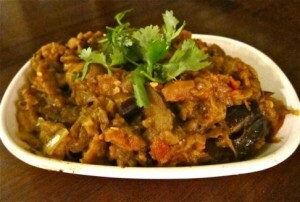 Enter baingan bharta, one of my favorite North Indian dishes. 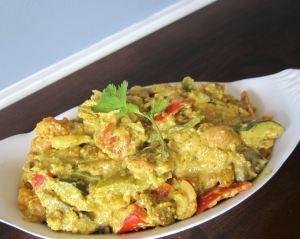 I adore Indian food and have made lots of it in my time, but I had never made baingan bharta. No better time than the present, right? As this was my first time making it, I simply googled “baingan bharta” to peruse what was out there and eventually employed a variant of this recipe. I began by roasting two big eggplants and two large tomatoes; I also added some mustard seeds during preparation. The big difference is that I could not bear (she says, dramatically) to throw out the nutrient-rich skins of both eggplants. I do think that a good portion of the eggplant needs to be mashed to retain the authenticity and flavors of the dish, so one skin had to go. 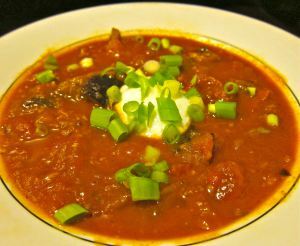 However, I decided to chop the second eggplant into large bite-sized chunks and add them unmashed, peel and all. This provided alluring color, as you could then see some purple peeking through the dish (above, left). Retaining chunks and peels also added lovely texture and increased the nutrient content. Finally, because the eggplant hunks required more mastication (chewing) than mashed eggplant, my version of the dish takes more time to eat. Combining the increased chewing time and extra fiber helps you to feel fuller on fewer calories, which are both great strategies to manage weight. I was delighted with the way this dish turned out, and it worked beautifully served with brown jasmine rice and raita (pictured above). The skins of vegetables are loaded in nutrients and fiber. Remember that it’s the deep colors of vegetables that often indicate valuable phytonutrients (i.e., bioactive, health promoting chemicals found in vegetables). This is one reason why consuming a variety of brightly colored vegetables and fruits is so important to health. In addition to other beneficial nutrients, eggplant skin contains an anthocyanin known as nasunin, which is a powerful antioxidant with a deep purple hue. Some skins are incredibly fibrous and can’t easily be consumed or digested by humans, but I think a lot of people peel vegetables out of habit, or from what they experienced as a kid. I encourage you to rethink this strategy. I never peel carrots, for example. And potatoes? I eat them infrequently, but if I use chopped potatoes like thin-skinned yukon gold in a soup or, say, aloo gobi, l don’t peel them. Eggplant and other vegetables have fiber inside as well as out, but you’ll get more if you keep the skins on. As well, there are many different types of fibers (soluble and insoluble, for starters), and consuming both the skin and flesh ensures you are getting the most nutrition out of your vegetables. We all need more fiber, which is associated with less cardiovascular disease and some cancers, and antioxidants are important in fighting off our daily oxidative insults that are associated with aging and some cancers. One caveat is because the skins are what came into contact with the earth and/or whatever chemicals were used to grow them, it’s important to wash your vegetables really well before using them. (Water works just fine.) It is always better to choose organic produce if you are able in order to reduce your pesticide exposure, but if you can’t find it, can’t afford it, or whatever, the health benefits of eating any vegetables and fruits far outweighs whatever risks you incur from consuming non-organically grown produce. More on this topic is coming very soon! Shakespeare AND eggplant, all in one post? (“To thine own self be true” is one of my favorite lines from Hamlet, by the way.) Herein lies the beauty of writing: you never quite know where exactly things will go. Nevertheless, I hope you’ve found a little inspiration somewhere in here today at week’s end, whether via eggplant, Indian food, or the Bard. 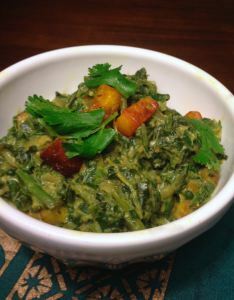 Thanks for including the recipe for Raita. This was great, I love Eggplant!! Absolutely! 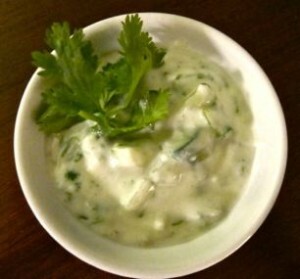 You can google raita, too, to see other recipes but it’s very basic and can be made to taste. Love it. You are hilarious. I am also going to try to incorporate “increased chewing time” into my daily life and see where it takes me. I can’t wait to make this dish, thank you!